It’s easy to get comfortable with one’s branding and marketing plans. Slide decks presented at the sales meeting look great. Branding exercises give the executives a warm-fuzzy. Advertising and PR schedules are polished to a shine. But all it takes is one small leak, possibly in the form of two bored employees with a flip cam, to turn everything upside down overnight. Many of us eat Dominos – so this had a personal impact. It’s possible that this will be the one viral social media event that changes how people think about their branding campagins. Rather than placing Social Media on the “Day 3: If we have time” page of the agenda, it’ll get attention in the main discussion. • Respond quickly. Domino’s responded within hours. • Respond at the flashpoint. 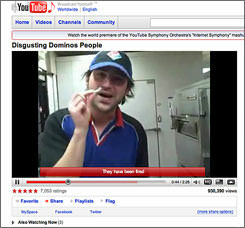 Domino’s first responded on consumer affairs blog The Consumerist, whose activist readers helped track down the store and employees who made the video. Then it responded on the Twitter site where talk was mounting. • Educate workers. It’s important that all employees have some media and social-media training, says Ross Mayfield, co-founder of Socialtext, which advises companies on new media. • Foster a positive culture. Workers who are content and customers who like your product are far less likely to tear down a company online. The good news is that much of the recommended list are pretty easy to accomplish. It just take executive support and real time to execute. People need to be accountable for their role in protecting the brand and social media networks must be part of the picture.